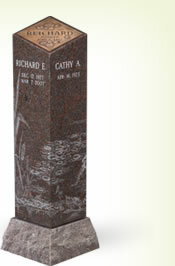 Memorialization is a permanent record and celebration of a life, and of those who loved that life. The practice of choosing cremation as an alternative to the traditional internment has not changed the public’s desire to remember and honor life. This desire is still as strong as ever. Even with the cremation ashes scattered from the tops of mountains or in the sea, families still want to memorialize a life that was lived, to tangibly show their love and have a focal grieving point. Whether it be a granite bench at a golf course, a sculpture in a park or a rustic boulder by a river or lake, unique cremation memorials can fulfill our desire to remember.